I hope your Monday was a little better then mine. I kind of got off on the wrong track and slept in a little.. Oops well a big cup of coffee helped me through the day that's for sure. So I recently picked up these two gorgeous colors, and I have to say "I'm in love with them"! I don't know what it is with baby pinks and nudes but I really like the way they look. 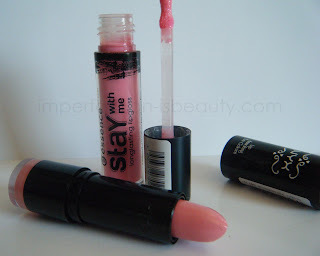 The NYX Strawberry Milk color is a soft milky baby pink hence the name lol. It lasts a decent amount of time. I love NYX lipsticks because so far they all have been a perfect match, their all so moisturizing, and I love the glossy feel they have. You could get away with using it without any gloss over top. 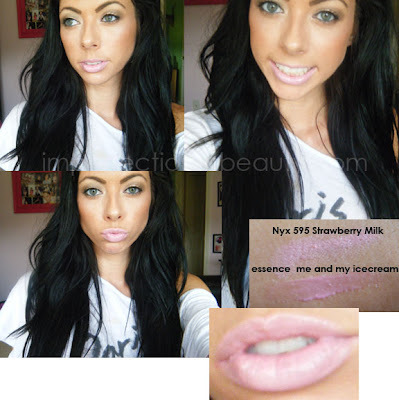 essence stay with me me and my icecream is by far one of my favorite glosses right now. I love the smell of it OMG I want to eat it right off my lips. These essence glosses are pretty long lasting, and very moisturizing as well. I love the fact that it smells like ice cream that's my favorite part about them! You can purchase both products at Ulta. There both so inexpensive and so fun I can't wait to pick up a few more! those lippy's sound delious! 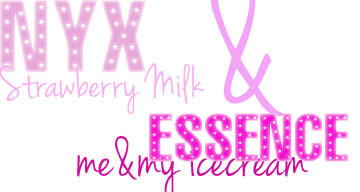 strawberry milk&icecream? yum! the combo looks so good on you!